Willie Hayes Shoemake was born, grew up, married three times, and died – all in Putnam County, Tennessee. He was too young to have been drafted into World War I and too old (and married with children) to have served in World War II, so it is possible he never left the county. 1st Great-grandfather: James “Jim” M. Shoemake Sr.
Willie Shoemake was born 15 March 1905 in Putnam County, Tennessee, probably near Cookeville, which is about 80 miles east of Nashville, to James “Jim” and Mary Fannie Shoemake. He was in the middle of 11 children. The 1910 Census finds a family of James & Fannie, with seven of their children, Homer, Oscar, Haskell, Marshel, Willie, Andrew, and Madelia, renting a house along Cookeville and Smithville Road. Willie’s father, James, is a “sawer” at a lumber mill; older brothers Oscar and “Haskie” are laborers at a lumber mill. “Haskie” and Oscar are only 11 and 13 respectively, neither are attending school, and neither could read and write. Willie’s oldest brother, Homer, is a laborer doing odd jobs. Besides appearing like a family in poverty, the 1910 Census also tells the story of great loss. It reports that “Fannie” had 11 children and only nine were living in 1910. So, two children were born and died before 1910. There is also one more child of James and Fannie whose name I’m not confident about. In 1923, Willie married Berchie A Bryant. Willie was 18 and Berchie was 15 years old. The 1930 Census finds the young family of Willie, Berchie with 4-year-old Gladys Rosalee and baby James Cecil (8 months old). Willie owns his home and is a truck driver for a planning factory. Birchie died on 12 March 1932 at the age of 24. 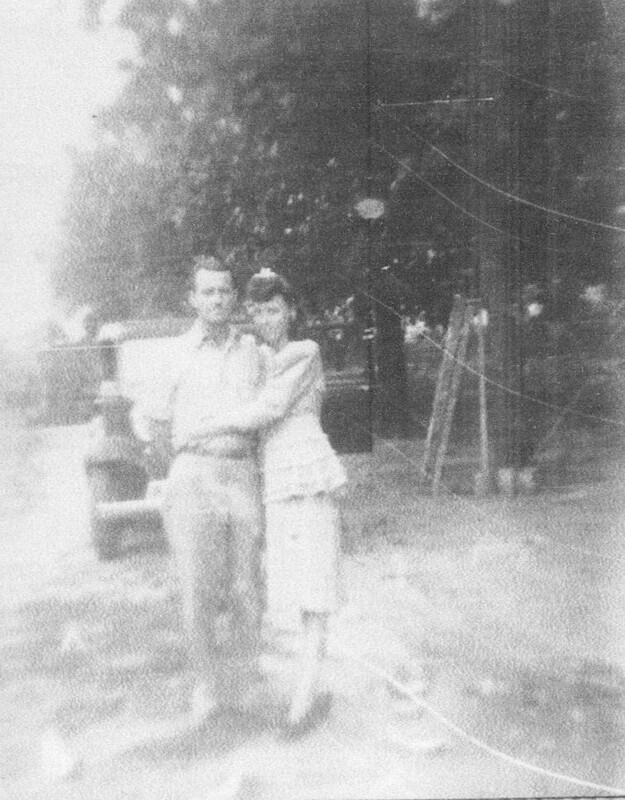 Willie married Ruby Foster Wilmoth in 1933. The 1940 Census finds Willie’s family consisting of him and Ruby. With them is 10-year-old James plus two young children, five-year-old Ruby J and a newborn, Robert. Willie is a painter and decorator. Fifteen-year-old Gladys does not appear with them in the 1940 Census. Further research will be needed to determine where Gladys went. On 18 March 1943 Ruby gave birth to another son, Willie Paul Shoemake. Willie Paul died eight months later on 28 November 1943. Willie married Rosa Burris in 1958. In 1958 Rosa was 50-years-old, so Willie and Rosa had no children. Willie died on 25 April 1962 at the age of 57 at Cookeville General Hospital. He was buried at the Judd Church Cemetery, Cookeville, Putnam County, Tennessee. His wife Rosa joined him in death 13 years later and was buried with him. None – Research of James and Fannie should fill in several of the known holes in the tree. 1910 Census, Various, James M Shoemake – Cookeville, Putnam, Tennessee (FS). Family Search. https://www.familysearch.org/ark:/61903/1:1:MGFQ-SZ2. 1920 Census (A), Ancestry.com, James M Shoemake – Putnam, TN. 1920; Census Place: Civil District 16, Putnam, Tennessee; Roll: T625_1759; Page: 8A; Enumeration District: 88. https://search.ancestry.com/cgi-bin/sse.dll?db=1920usfedcen&indiv=try&h=36052847. 1930 Census (FS), Family Search, 1930 Census – Willie Shoemake – Putnam, TN. 1930; Census Place: District 1, Putnam, Tennessee; Page: 8B; Enumeration District: 0002 – Ancestry. https://search.ancestry.com/collections/6224/records/66728296. 1940 Census (FS), Family Search, Willie Shoemake – Putnam, Tennessee. “United States Census, 1940,” database with images, FamilySearch (https://familysearch.org/ark:/61903/1:1:K4ZJ-BXM. accessed 8 March 2018), Willie Shoemake, Civil District 1, Putnam, Tennessee, United States; citing enumeration district (ED) 71-5, sheet 1A, line 19, family 5, Sixteenth Census of the United States, 1940, NARA digital publication T627. Records of the Bureau of the Census, 1790 – 2007, RG 29. Washington, D.C.: National Archives and Records Administration, 2012, roll 3928. Find A Grave, database and images (https://www.findagrave.com : accessed 11 March 2018), memorial page for Willie Hayes Shoemake (15 Mar 1905–25 Apr 1962), Find A Grave Memorial no. 58511255, citing Judd Church Cemetery, Cookeville, Putnam County, Tennessee, USA ; Maintained by Papa Randy (contributor 46864588) . Tennessee, Death Records, 1914-1963, Family Search, Willie Hayes Shoemake – Death 25 Apr1962. “Tennessee Death Records, 1914-1963”, database with images, FamilySearch 24 October 2016), Willie Hayes Shoemake, 1962. 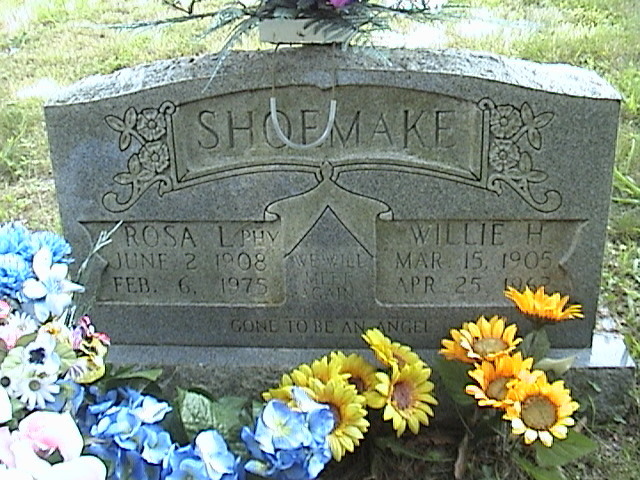 “Tennessee Death Records, 1914-1963,” database with images, FamilySearch (https://familysearch.org/ark:/61903/1:1:NSTM-N43 : 25 May 2014), Willie Paul Shoemake, 28 Nov 1943; citing Judd Cemetery, Cookeville, Putnam, Tennessee, 24298, State Library and Archives, Nashville; FHL microfilm 2,137,340. Tennessee, State Marriages, 1780-2002, Ancestry.com, Willie Shoemake & Birchie Bryant – 24 Jun 1923. Ancestry.com. Tennessee, Marriage Records, 1780-2002 [database on-line]. Lehi, UT, USA: Ancestry.com Operations Inc, 2008. Original data: Tennessee State Marriages, 1780-2002. Nashville, TN, USA: Tennessee State Library and Archives. Microfilm. https://search.ancestry.com/collections/1169/records/2817262/. I was really excited when one of my grandchildren indicated that she was interested in her family history. In particular, she wondered about her paternal grandmother’s family, the Rittenberrys. I knew very little about them, so I jumped at the chance to research some her ancestor’s history. To bypass living individuals, I thought I’d start with her grandmother’s grandfather, William Dee Ester Rittenberry. 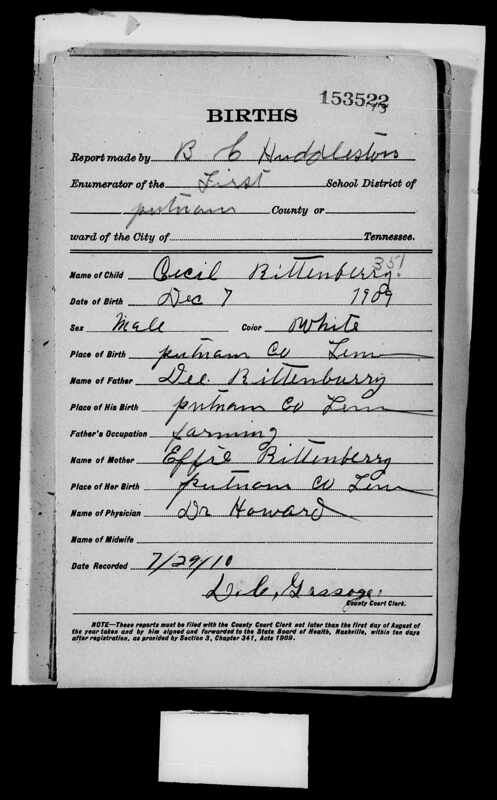 Through the many records the surname takes many forms, Ritenberry, Writtenberry, and Ritenburg. I have settled on Rittenberry both as the most common spelling and as the modern spelling used as the maiden name by her grandmother. Also, for ahnentafel numbering, I begin with her living grandmother as person #1, making her grandmother’s grandfather Ancestor #4. William Dee Ester Rittenberry, known as “Dee,” was born on 28 Oct 1882 in Buffalo Valley, Putnam County, Tennessee. Buffalo Valley is an unincorporated community in Putnam County, Tennessee. It is exit 268 on Interstate 40. When he was 19, Dee married Dora Effie Jane Chism, known as Effie. She was the daughter of Charlotte (Chism), on 15 Oct 1902 in Putnam County, Tennessee. 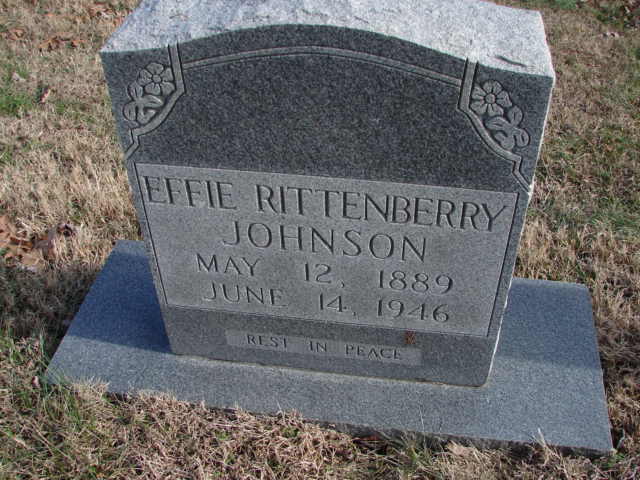 I am not sure about Effie’s father’s name and need to do more research regarding this family. Ethel Lee Rittenberry was born in 1904 in Tennessee. She died before Jan 2001. Evelyn M Rittenberry was born on 29 Apr 1907 in Putnam County. She died on 03 Jan 2001 in Cookeville, Tennessee at the Masters Health Care Center. She married a man surnamed Stone. Cecil Rose Rittenberry was born on 07 Dec 1909 in Algood, Tennessee (See Article). She died on 08 Jun 1945 in Cookeville, TN. John D Rittenberry was born in 1913; he died before Jan 2001. T J Rittenberry was born on 16 Jun 1917 in Putnam County; he died on 08 Jun 195715 in Nashville, Davidson, Tennessee at Saint Thomas Hospital. L B Rittenberry4 was born on 28 Apr 1920 in Tennessee. He died on 07 Dec 1976 in Goodletsville, Davidson County, Tennessee. He married Ruby Jean Shoemaker sometime before 01 Apr 1940. William D Rittenberry, Jr. was born about 1924. Lucile Rittenberry was born about 1925. 1900 – William Dee Ester Rittenberry lived in Civil District 19, Putnam, Tennessee on 01 Jun 1900. He was a Laborer at the Sparta Spoke Factory. The Sparta Spoke Factory was established in 1896 on the Calfkiller River and became the world’s largest producer of wooden spokes. As the demand for wooden spokes decreased, the company changed over to custom furniture and furniture components. Today the company is known as Sparta WoodWorks. 1910 – Cookeville and Ganesborrow Road Cookeville, Putnam, Tennessee. He was a farmer, farming a rented farm with his wife, and three children, Ethel, Every, and Mary (Cecil). Living with them was his mother-in-law, Charlotte Chism. 1918 – He registered for the draft on 12 Sep 1918 in Crawford, Overton County, Tennessee. He was described as medium height, medium build, Blue eyes, and light hair. Occupation: Coal Digging with Brice Hill. Dee never served. 1920 – Dee is living in Crawford, Overton County, Tennessee. He is working as a coal miner. Living with him are his wife, three daughters, two sons and his uncle, Carnie (possibly Carrie), Rittenberry. 1930 – The depression was tough on coal mines and Dee appears to have been impacted by it. The 1930 Census shows him working as a laborer in a public works project. It also shows Dee had moved back to Putnam County, TN, and was living with his wife and kids. Also, living with him is a granddaughter, Juanita Harris. 1951 – It appears that he retired on 15 Feb 1951 and went on social security. He lived in Cookeville until his death in 1961. William Dee Rittenberry died on 24 May 1961 at the Putnam County Poor Home in Cookeville, TN, at the age of 78. He was buried at the Shipley Cemetery in Cookeville, Putnam County, Tennessee. Per Find-a-Grave, There are 14 Rittenberrys buried at Shipley Cemetery. It is clear from the census records that family was important to Dee Rittenberry. Although they were poor and had little during the depression, it is clear they took on family members that needed support and helped all they could. Find William Dee Rittenberry in the 1940 Census. 1900 Census (A), Ancestry.com, Henry Rittenberry – Civil District 19, Putnum, Tennessee. http://search.ancestry.com/search/collections/1900usfedcen/60988514/printer-friendly. 1910 Census (A), Ancestry.com, William D Writtenberrg [Rittenberry] Cookeville, Putnam, Tennessee. http://search.ancestry.com/search/collections/1910USCenIndex/27407587/printer-friendly?ssrc=pt&tid=17307912&pid=497379009&usePUB=true. 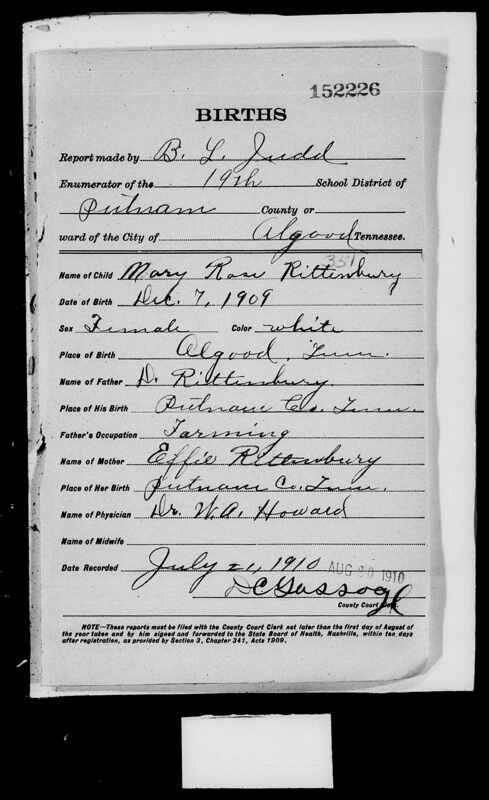 1930 Census (FS), Family Search, 1930 Census – Dee Rittenberry – District 19, Putnam, Tennessee, ED 71-23, Sheet 2B. “United States Census, 1930,” database with images, FamilySearch : accessed 15 July 2017), Dee Rittenberry, District 19, Putnam, Tennessee, United States; citing enumeration district (ED) ED 23, sheet 2B, line 89, family 46, NARA microfilm publication T626 (Washington D.C.: National Archives and Records Administration, 2002), roll 2269; FHL microfilm 2,342,003. http://(https://familysearch.org/ark:/61903/1:1:SPQR-745. 1940 Census (FS), Family Search, 1940 Census – L B Rittenberry – Chattanooga, Hamilton, Tennessee, ED 96-97, Sheet 3A. Find a Grave, Find a Grave, L B Rittenberry – Memorial 62882853. https://www.findagrave.com/cgi-bin/fg.cgi?page=gr&GRid=62882853. 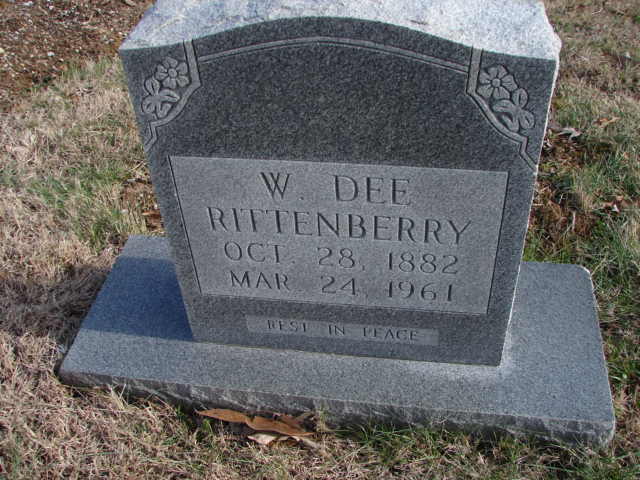 Find a Grave, Find a Grave, W Dee Rittenberry – Memorial #62882879. https://www.findagrave.com/cgi-bin/fg.cgi?page=gr&GRid=62882879. Other, SSDI. Number: 412-10-6466; Issue State: Tennessee; Issue Date: Before 1951. Tennessee Death Records, 1914-1963, Family Search, Cecil Rose Rittenberry. “Tennessee Death Records, 1914-1963,” database with images, FamilySearch (https://familysearch.org/ark:/61903/1:1:NS7C-X5B : 25 May 2014), Cecil Rose Willoughby, 08 Jun 1945; citing Cemetery, Cookeville, Putnam, Tennessee, 12601, State Library and Archives, Nashville; FHL microfilm 2,137,360. https://familysearch.org/ark:/61903/1:1:NS7C-X5B. Tennessee Death Records, 1914-1963, Family Search, T J Rittenberry. “Tennessee Death Records, 1914-1963”, database with images, FamilySearch (https://familysearch.org/ark:/61903/1:1:QKM9-LKMV : 3 April 2015), T J Rittenberry, 1957. Tennessee Death Records, 1914-1963, Family Search, William Dee Rittenberry. “Tennessee Death Records, 1914-1963”, database with images, FamilySearch ( : 3 April 2015), William Dee Rittenberry, 1961. https://familysearch.org/ark:/61903/1:1:QKMS-83FJ. Tennessee, Birth Records (ER Series), 1908-1912, Family Search, Mary Rose Rittenberry. “Tennessee, Birth Records (ER Series), 1908-1912”, database with images, FamilySearch (https://familysearch.org/ark:/61903/1:1:Q2H5-C9Z1 : 4 November 2016), Mary Rose Rittenbury, 1909. Tennessee, County Marriages, 1790-1950, Family Search, William Dee Rittenberry & Effie Chism. “Tennessee, County Marriages, 1790-1950,” database with images, FamilySearch (https://familysearch.org/ark:/61903/1:1:QKHQ-M4MZ : 22 December 2016), Wm D Writtenbury and Effie Chisom, 15 Oct 1902; citing Putnam, Tennessee, United States, Marriage, p. , Tennessee State Library and Archives, Nashville and county clerk offices from various counties; FHL microfilm 979,724. S., Social Security Applications and Claims Index, 1936-2007, Ancestry.com, Dee Rittenberry. United States World War I Draft Registration Cards, 1917-1918, Family Search, William D Rittenbeary. “United States World War I Draft Registration Cards, 1917-1918,” database with images, FamilySearch (https://familysearch.org/ark:/61903/1:1:KZ6X-M4Rv : 12 December 2014), William D Rittenbeary, 1917-1918; citing Overton County, Tennessee, United States, NARA microfilm publication M1509 (Washington D.C.: National Archives and Records Administration, n.d.); FHL microfilm 1,877,604. https://familysearch.org/ark:/61903/1:1:KZ6X-M4R.